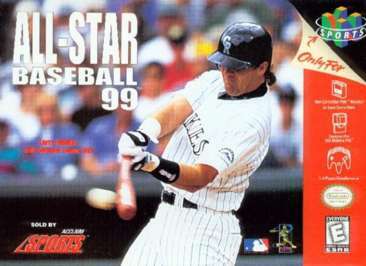 All-Star Baseball 99 for Nintendo 64 features all 30 Major League Baseball teams. Game modes include Training, Season, Playoff, World Series, plus an All-Star Match, Home Run Derby, and a section of MLB trivia. 100 different batting styles are featured, as well as motions such as sliding catches, base collisions, kneeling throws and broken bats. You can release, sign up and trade players from all around the league, creating your own team from the entire 700 player roster, which includes minor league players ready to be discovered.